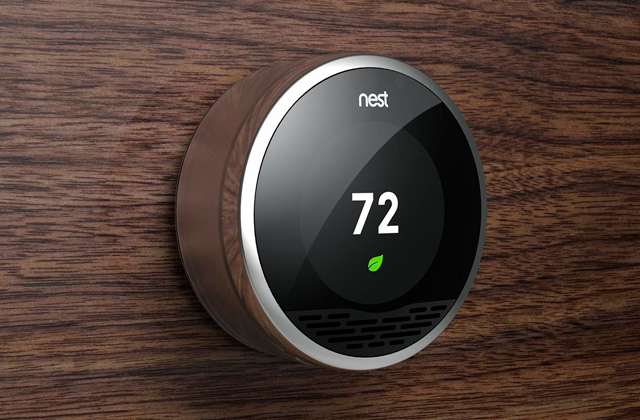 A sensitive thermostat will let you accurately adjust the desired heat level. 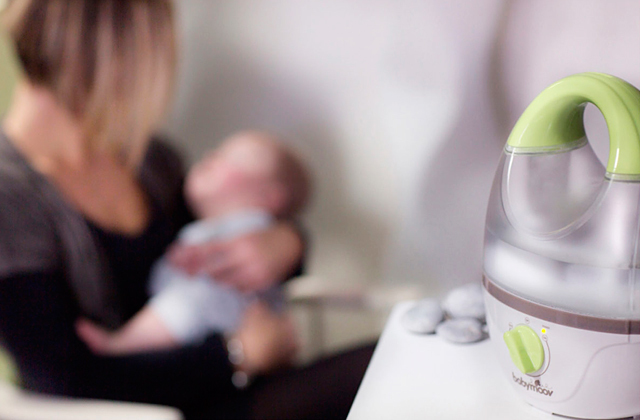 Meanwhile, the upward heat output ensures even hot air distribution to quickly create ambient warmth. The fence door might get jammed from time to time. This fireplace insert from PuraFlam will ideally fit any interior design from classics to loft and high-tech. Whether you need to revamp your old fire-place or plan to build a fake one, this model will keep you covered. It will bring the functionality and realistic effect of the flame-burning hearth to your living room, dining room, or any other middle-sized room in your house. 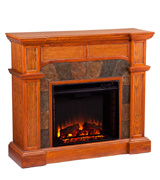 26.99" x 35.04" x 8.78"
The hefty wooden mantel is highly durable and can endure a load of about 85 pounds. Hence, it can double as a fully functional stand for a TV panel up to 43.25" in diagonal. A pretty heavy model that complicates handling a bit. This oak finished electric space heater from Southern Enterprises combines a stylish antique look with an exceptional functional versatility. It will serve as an efficient space heater to warm up any average-sized room, a media console, and an elegant piece of decor to add comfort and coziness to your living space. 40" x 45.5" x 14.5"
Thanks to the patented 3D flame technology and side viewing windows, the manufacturer managed to achieve the maximum true-to-life flame effect. Besides, there is a number of adjustable flame settings to meet any personal preferences. A slight ticking noise during operation. 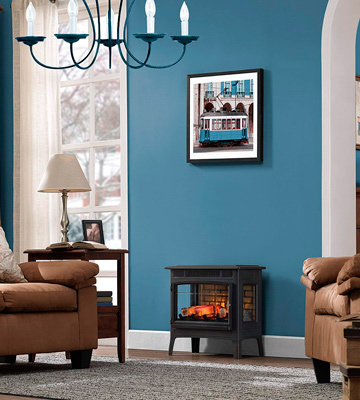 Encased in a solid metal body and supported by strong legs, the Duraflame electric fireplace looks pretty much like a traditional log hearth, yet, still offers the conveniences of modern appliances. Designed to heat up really large areas while consuming minimum energy, this model will add style and warmth to open spaces, covered terraces, and any other large spaces. 23.4" x 24" x 13.07"
With 5 flame brightness settings and heat-off function, you are free to use this model just as a piece of decor. You can enjoy the flickering flames any time of the year without paying too much for the electricity. A somewhat low sensitivity of the control panel. 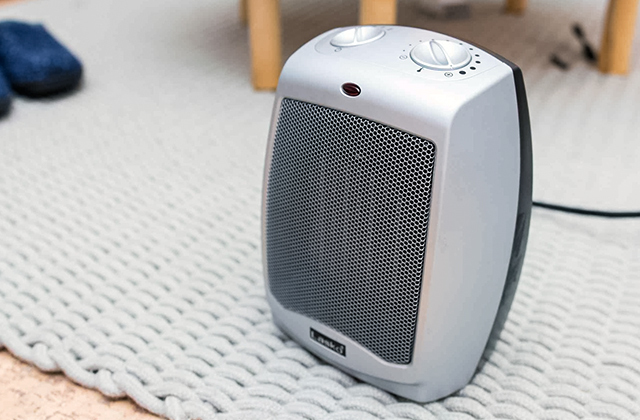 If you need a functional space heater to warm up middle to large spaces when it's freezing outside and a no-fume fireplace to create a comfortable homey atmosphere all year round, this model will definitely be right down your alley. Easy-to-install and safe-to-use, it will serve you for years to come. 21" x 28.5" x 6"
The unit comes fitted with massive yet elegant legs to ensure stability on any surface. Meanwhile, the top panel can serve as a shelf or stand to place a vase, photo frames, statuettes, and some other pieces of decor. The HomCom 820 is a budget-friendly electric model in a sturdy steel body with copper effect handles. Overall, it looks like an authentic little hearth you would find in almost any house a century ago. The unit will become a functional, practical, and stylish addition to any middle to small room. 21.6" x 16.3” x 11"
up to 323 sq. 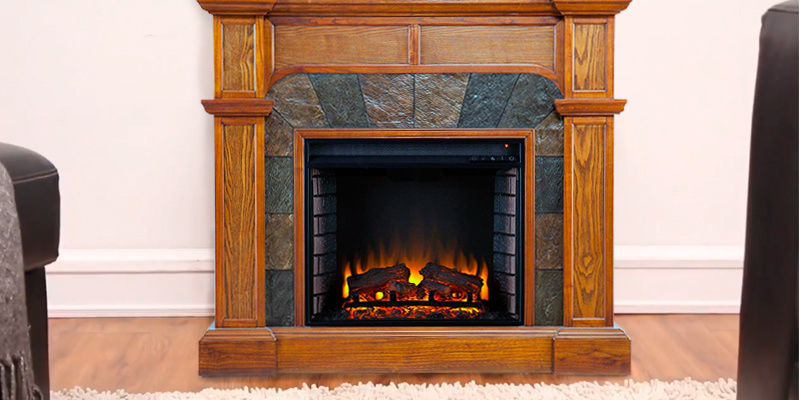 ft.
Building up a wood-burning fireplace is a costly and often troublesome affair. Apart from a hefty investment, it might require some constructional and design changes, not to mention the following maintenance, risk of fire, and fumes permeating around the room. Yet, there is an alternative solution that will bring the soothing warmth and ambiance of a real fireplace with much less hassle and costs. 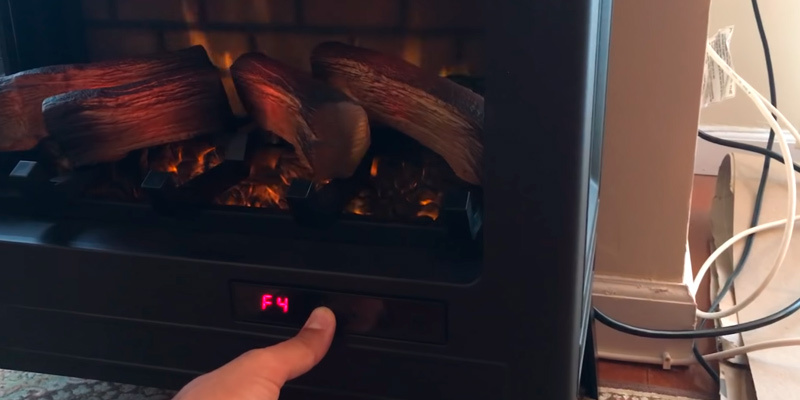 It’s the electric fireplace insert from PuraFlame. This model uses energy-saving and highly efficient LED and infrared technologies. LED bulbs will last longer and deliver an emulated flame effect with glowing embers and cast shades just like with real burning wood. Internal brick walls and mock resin logs further enhance the realistic effect and give the whole unit the look of a classic hearth. Meanwhile, a 1500-watt infrared heater ensures decent heating performance for a room up to 400 sq.ft. It exudes heat via the vents above the hearth and a fan directs it upwards, quickly filling the room with nice warm air. Functional and nice-looking, the PuraFlame fireplace also boasts exceptional adjustability to let you customize the heat and visual effects to your needs. Moreover, a remote control will let you do it from a distance without even the need to leave the couch. 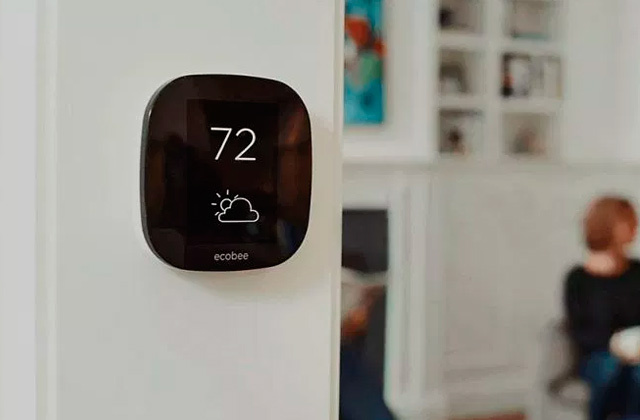 Thus, a sensitive thermostat will let you accurately set a temperature with a range from 60 °F to 84 °F to achieve the desired heat level. Besides, 3 levels of flame brightness and intensity allow varying between lively dancing bright flames and smoldering fire glowing with different shades on life-like coals. With the functionality and performance efficiency beyond any doubt, the PuraFlame is distinguished by a solid minimalistic design. The whole unit is encased in a high-precision steel trim with a fence door of clear glass that gives it an aesthetically complete look. Unlike freestanding models, this unit is an insert and needs some installation though. But what will really impress you is how easy it is to install and how many installation options it offers. As the name suggests, first and foremost, it can be installed in an existing fireplace which is a truly great option to breathe in a new life into an old non-operational hearth. Besides, you can recess it into a wall niche or build it into a cabinet or enclosure. There is a whole number of options depending on your interior design. And you can do it all by yourself without any assistance. To round things up, the PuraFlame is a functional and efficient alternative to a real fireplace that will save you not only money but also the troubles and hassles related to a real hearth build-up. It is safe, produces no fumes and ash, a breeze to use and will bring you the warmth and homey atmosphere created by real fire. When it comes to household appliances, multifunctionality is always the key to success. The same is true for the Southern Enterprises Elkmont fireplace. In what way can a fireplace be multifunctional you wonder? Since it is an electric model, it has much more to offer than you would expect. See for yourself. First off, all real fireplaces exude heat and function as added sources of heat on those chilly days and so does the Elkmont fireplace. You’ll get an efficient electric space heater for any average-sized household space. However, while a burning fireplace will rather warm up the area right in front of it and you will need to constantly add firewood, this unit functions as an electric stove heating up a whole room and will maintain a consistent temperature. 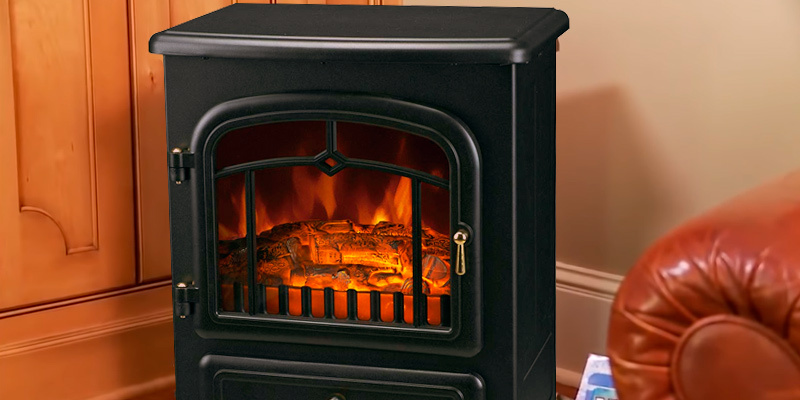 Behind the artificial hearth is a 1500-watt fan-assisted heater that applies convection principles to quickly warm up an area up to 400 sq.ft. With that, no chimney or added ventilation for better air circulation are needed since the appliance produces no emissions. Just plug the unit in and enjoy a comfortable warmth. What’s more, you can set the air heating temperature from 62 to 82 degrees at 4-degree intervals and do it either by means of a manual control panel or remotely. Next, it is a fireplace, though an electric one, and you’ll enjoy all the fireplace benefits as well. The firebox with an interior brick design, half-burned logs and coals made of special resin look pretty much like the real thing, especially at some distance. To further evoke realism, LED bulbs under the firewood mimic the fire flickering with multicolor flames and glowing embers. Hence, apart from the heat, the appliance generates light and provides an optional down light illumination source. Along with a thermostat, a remote control allows adjusting a timer and flame brightness and intensity. Thus, you can go for a more intense and brighter flame or choose a dim glow to set up a certain mood or atmosphere. Meanwhile, a built-in timer with a shut-off option will automatically switch off the heat once the air is warmed up to the set temperature. A source of heat and a source of light, what else can it offer? Fitted with a hefty wooden mantel enduring the load of 85 pounds, the Elkmont fireplace also doubles as a media console and can accommodate a digital TV panel up to 43.25” in diagonal or a kind of media center. Apart from the above mentioned functional versatility, there is one more thing about the Southern Enterprises faux fireplace that will get you hooked at a glance. It’s a stunning design of this model in antique style. 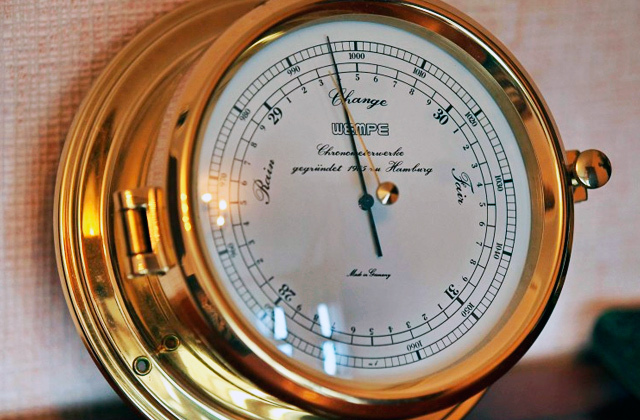 If you had a chance to peep into luxury interiors of the Victorian age, you would see something like that for sure. Wood, stone, metal, and glass are exquisitely combined in a well-balanced composition. A steel framed hearth is embedded into a large particle board decorated with veneer tiles simulating natural stone and trimmed with a gorgeous oak mantel. The whole assembly looks solid and will add a touch of Victorian luxury, style, and character to any classic, modern classic, rustic, or traditional interior. Besides, this free-standing model will only need a simple initial assembly and no installation. To cut a long story short, if you look for exceptional functionality paired with style and practicality, the Southern Enterprises is by far the best electric fireplace to go for. Just about a bit more than a century ago, a fireplace stove was a part and parcel of jazzy interiors in large mansions as well as a piece of common furnishing for townhouses. Yet, at that time, used more for heating rather than for decor, those stoves had to have exhaust pipes to remove emission gases. Nowadays, you can hardly come across these units in contemporary interiors or would rather find their gas counterparts adapted to modern utilities. 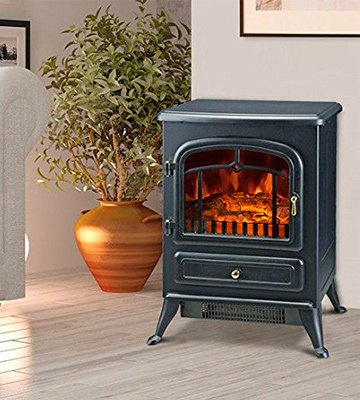 However, if you are into traditions and want to add a vintage touch to your household, you can’t help but like this electric fireplace heater from Duraflame. 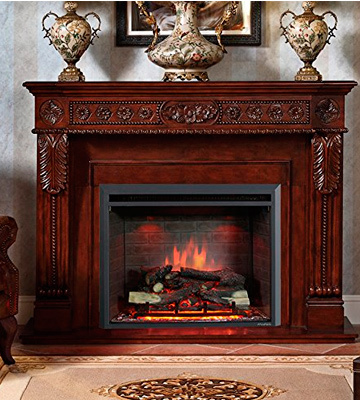 Packed in a traditional fireplace stove design and beautifully detailed with beveled glass and viewing windows, it will definitely become a focal point of room interior and a standout piece in your home. 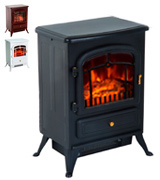 A stove body rests on 4 sturdy legs keeping it stable on any surface and preventing skidding. The whole construction looks pretty heavyweight but in reality, it is not that heavy and weighs about 28 pounds. So, you can move from one room to another without much hassle. Behind the glass door is a hearth made up of artificial logs against a brick background. The whole system is similar to that used by other manufacturers, however, what really sets this model apart from its rivals is a patent-pending 3D technology to display the most realistic flame possible. 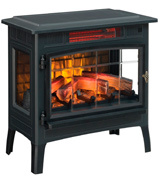 The layered flames flicker and dance on the logs and coal bed, giving the appearance of a real wood burning fire. Meanwhile, a number of adjustable flame settings ensure customizable visual effects and will meet the most exacting preferences. The flame color, brightness, and intensity settings can be conveniently adjusted either with the buttons on the control panel or with the remote control. 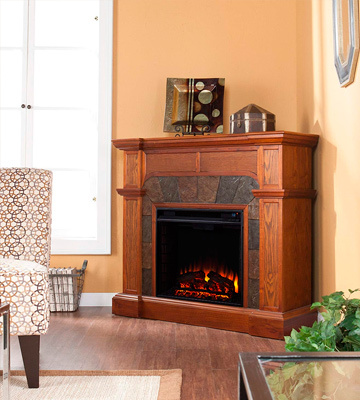 Realistic flames and a stylish vintage design are not the only merits of the Duraflame electric fireplace. 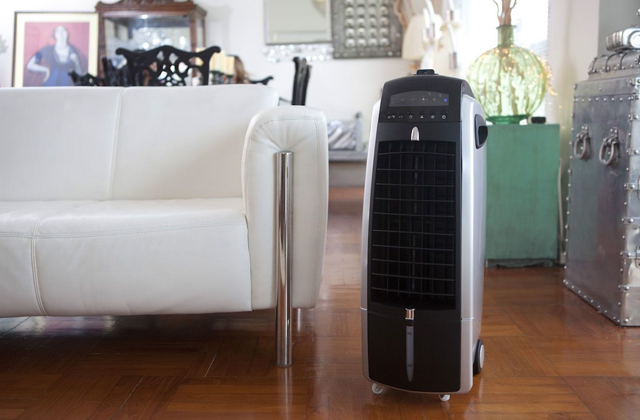 What you will get is not a mere piece of decor but also an efficient electric space heater for truly vast areas. Zone heating is one of the most effective ways to cut down energy costs and maintain the warm environment in large rooms and open spaces. 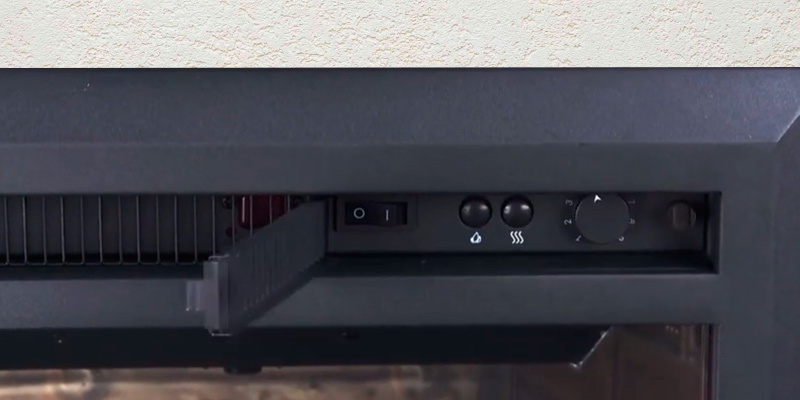 The core of this appliance hidden under a top panel is a powerful heater. It’s notable that while using 1500 watts of power just like other models in the range, this unit can heat up the space of about 1000 sq.ft. 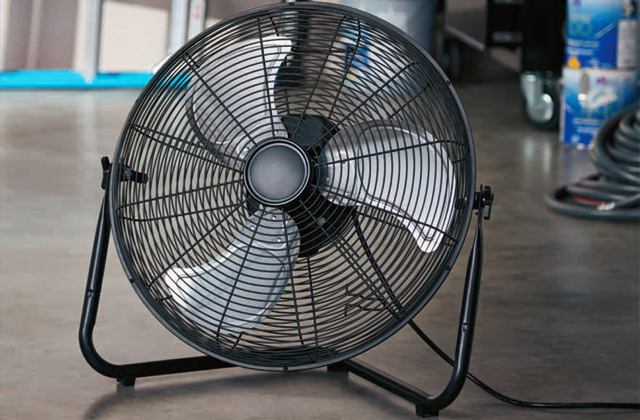 The fan-assisted system distributes heat quickly and evenly while an infrared quartz technology maintains the natural humidity in the air and prevents the air from overdrying. 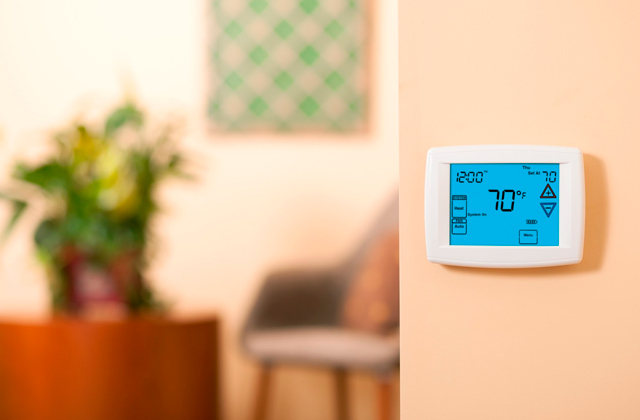 An adjustable thermostat allows choosing between several heat settings, and a built-in timer allows programming the heating time between 30 minutes and 9 hours. The safety features in this model meet the highest standards as well. Since there is no real fire, the whole construction remains cool to the touch. In the case of overheating, the unit will switch off automatically and a safety plug will immediately shut off if its temperature rises over the allowed level to prevent a short circuit and risk of fire. To sum up, combining traditions and energy-efficient modern technologies, the Duraflame electric fireplace will add style and warmth to open spaces, covered terraces, working offices, and any other large spaces. If you seek to create a cozy environment for a pleasant evening with family or a relaxing movie night with your partner and, at the same time, add warmth to the space, an electric fireplace heater from Best Choice Products will fit the bill. 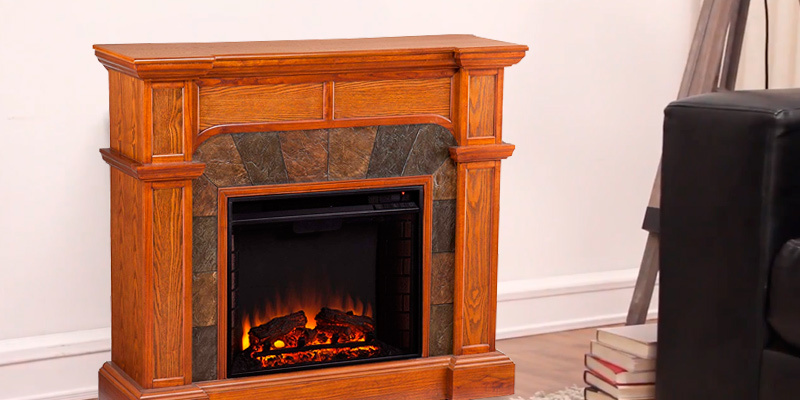 Featuring a fireplace insert design, this model will ideally fit into any existing fireplace, although you should go for a wall mount option if you have a niche to recess the unit or build it into a cabinet or a mantel for a fake fireplace. 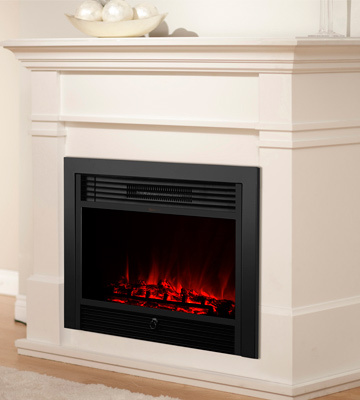 The no-frills design will seamlessly blend with any interior and look like a traditional hearth when inserted into a trimming frame or recessed into a wall enclosure. 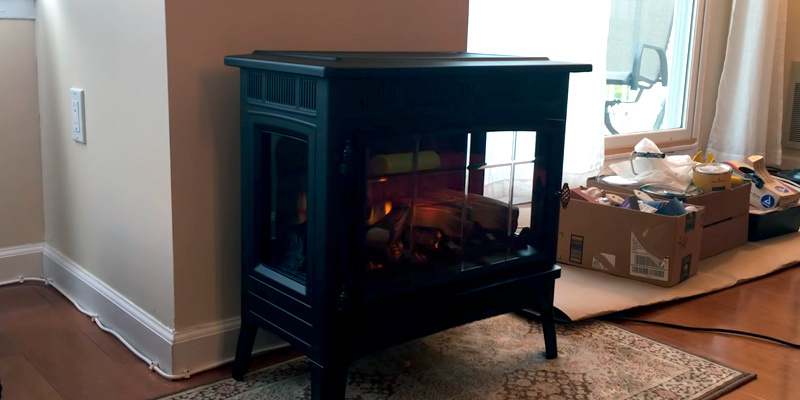 The appliance comes pre-assembled and all you will need is to fasten the frame cover with the screws to install the fireplace to where you need it. With the dimensions of 21" x 28.5" x 6", it’s a pretty compact unit that will find its place in a room of any size, be it a smaller bedroom and den or a larger living room, dining room or an open space lounge area. Though it has an average power of 1500 watts, which is not the highest rate out there, the fireplace is distinguished by a surprisingly high coverage and can efficiently heat up a space of 800 sq.ft. which is twice as large of an area than the other similar models can cover. Besides, you can go for low or high heat settings depending on the room area to optimize energy consumption and still achieve the desired level of comfort. It should be noted that most fireplace inserts are pretty expensive. Meanwhile, to buy the Best Choice Products electric fireplace heater you won’t have to spend a fortune, which makes it a great choice for thrifty customers. 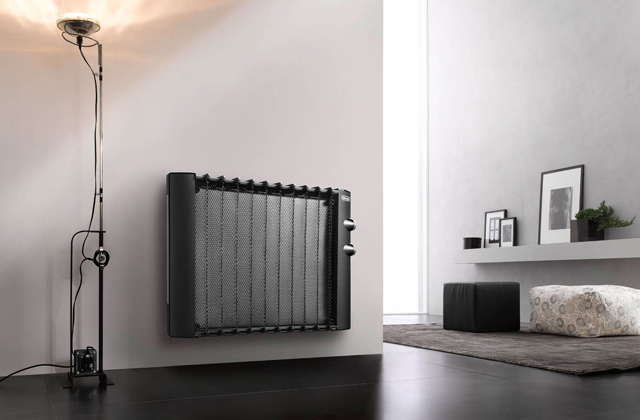 It is always nice to get a functional heater and the Best Choice Products will deliver up to par heating performance both for small and larger areas. However, buying a fireplace and paying a price many times higher than that of a standard space heater we want to get something more. Namely, it is not only an added source of warmth but also a piece of decor that will look realistic and fulfill one of its time-proven functions - create a comfortable and calming atmosphere that makes our home feel like a safe shelter we want to come back to again and again. And this model will cope with that task just perfectly. Behind a glass door is a mock-up of a coal bed filled with half-burned logs and coals. When turned on, it really looks like a fireplace. Lively flames dance on the burning wood and embers exude a charming glow. Other than that, there are as many as 5 flame settings to set up the mood and cozy atmosphere for any occasion, be it a friendly get-together, a romantic dinner or just a leisure time when reading a book or watching TV. Moreover, you can turn off the heat and enjoy the flickering flames at any season all year round. To put it in a nutshell, with this electric fireplace from Best Choice Products, you’ll get everything you expect from a functional fireplace and a high-performance heater, at a reasonable price and without paying too much for the electricity. If you are looking for a nice heater to brighten the interior and bring warmth to your home, we would highly recommend checking out this model from HomCom. The heating performance of this appliance is no slouch. The device has two heating settings, with the switches hidden under the front panel. It is also fitted with an adjustable thermostat, hence, you can set the desired temperature with one turn of the dial. On the maximum heat setting of 1500 watts, it will produce enough heat to warm up an area of 323 sq. ft. 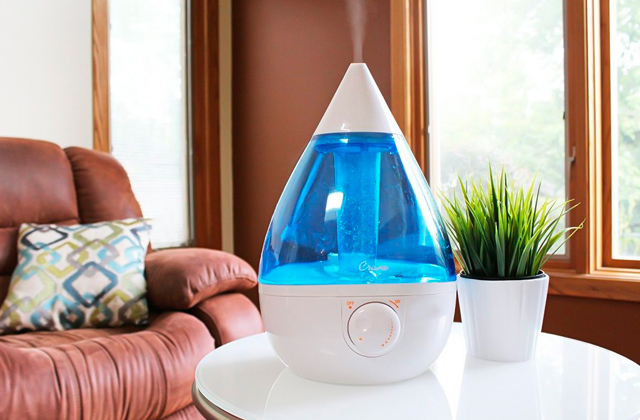 The lower setting requires 750 watts and will suit you if you want to heat a smaller area. For safety measures, the manufacturer equipped this device with overheat protection. 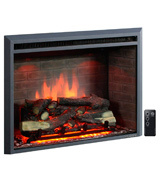 This electric fireplace is real eye candy for all those who love having authentic looking things in their house. Encased in a black stainless steel body, this appliance will be a great addition to your living room. The dimensions of the unit are rather compact, its sizes are 21.6" x 16.3” x 11". Therefore, finding a place for it in your room shouldn’t be a big problem. This unit is fitted with four massive legs that ensure stability on any surface, so you will have no worries about accidentally knocking it over. Meanwhile, a free-standing model is easily portable and, despite the stainless steel body, it is very lightweight, allowing you to move it to where you need without a hassle. In addition to the authentic design, the manufacturer also equipped this electric stove with a realistic fire effect. 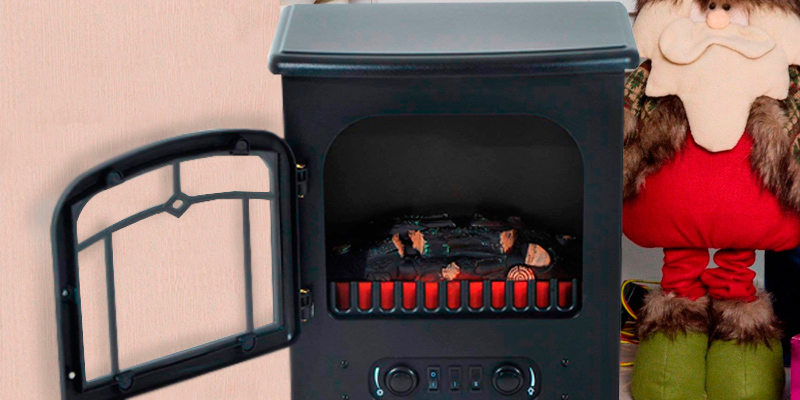 This HomCom appliance has the lifelike log effect with dancing flames that will make you feel like you are near an open fire without the risk of getting burned. You can spend cold winter evenings comfortably sitting in front of this device with no need to add wood or take out the ashes. For more comfort, you can manually adjust the brightness of the flames. The only thing that may break the illusion of the fire for you is that this heater is not the quietest model on the market. Thus, when it is working, you may hear a fairly quiet noise from the fan. Though we wish there weren't any sound, we would not call it a big con. To conclude, the HomCom electric fireplace can become a nice complement to your interior and warm you up during cold evenings. Thanks to the small size, it can fit into any room, yet it has the potential to heat up quite a large area. Plus, this purchase won’t cost you an arm and a leg. 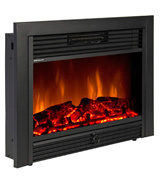 The HomCom fireplace will make you feel warm and cozy at any time of the year. Everybody wants to live in a comfortable house with all the amenities the 21st-century offers. A house is a real fortress for people, the place we all want to come back to. And a fireplace is a must-have for any truly cozy house. Today you don't even need to build a real chimney for a fireplace. Instead, you can use a high-tech electric fireplace stove that will look just like a real one. Imagine a quiet family evening in front of an electric fireplace: the pleasant warmth, the sound of crackling wood logs, the burning fire... And all of this is available without any real wood and unnecessary expenses. 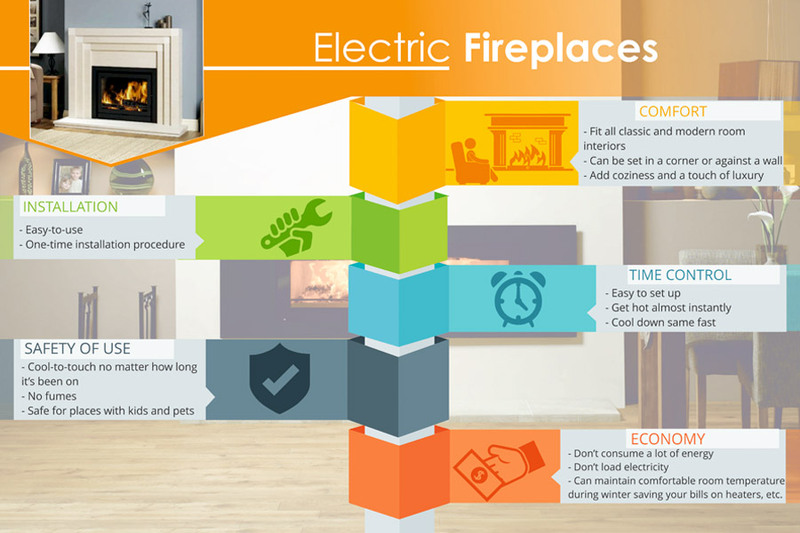 There are many electric fireplaces available to you on the market, but the choice is rather difficult. So, we have selected the best appliances for our brand-new electric fireplace review. If you adore spending evenings outside and want to create a warm atmosphere around, check out our review of patio heaters. 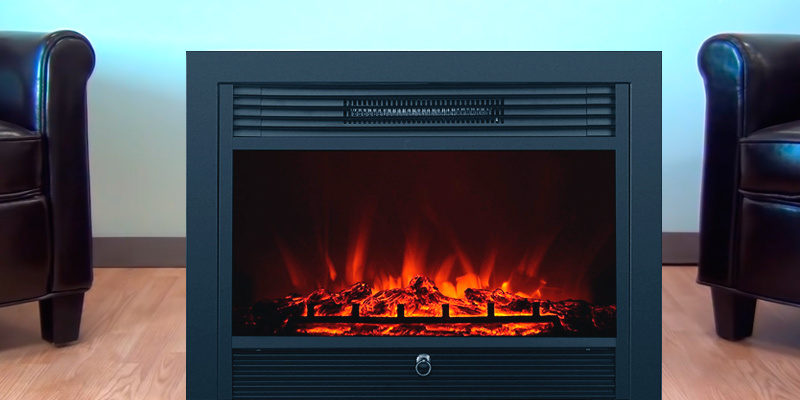 The first thing you should decide on is the Type and Installation of an electric fireplace. There are several major types of these appliances: fireplace inserts, free-standing, and wall-mounted. 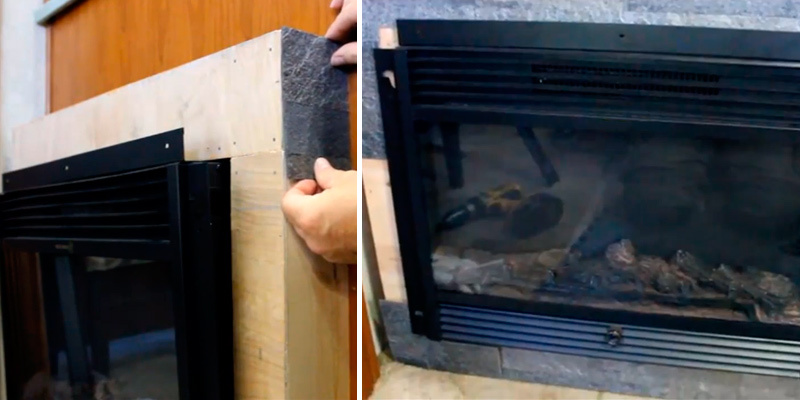 A fireplace insert is designed for fireplace openings (you can either build one in advance or make a new one) so that the fireplace looks 100% real. Many people install fireplace inserts in their basements and enjoy time in the coziness of warm air and crackling wood logs. Next, there are free-standing electric fireplace heaters that you can use anywhere - no preliminary preparation is required. Such units should only be installed properly. Some of them are media electric fireplaces, which means they have shelves for different devices (like a TV set or a DVD, for example), books, pictures, etc. If you are thinking of this type, make sure to choose the right size, so that the whole unit fits in your apartment. Of course, free-standing fireplaces can be easily moved from one room to another - they aren't usually too big and heavy. Finally, there are wall-mounted electric fireplaces that, as their very name indicates, are attached to the wall. As usual, these appliances boast a high-tech design, so they fit a modern decor of the apartment. In general, you should be sure an electric fireplace suits the style of the apartment. Next, an electric fireplace stove isn't only about design: heat and warmth matter. Thus, don't forget to check out the Heating Efficiency of every unit. No wonder, this criterion depends on power output, which usually varies from 500 Watts to 2000 Watts. 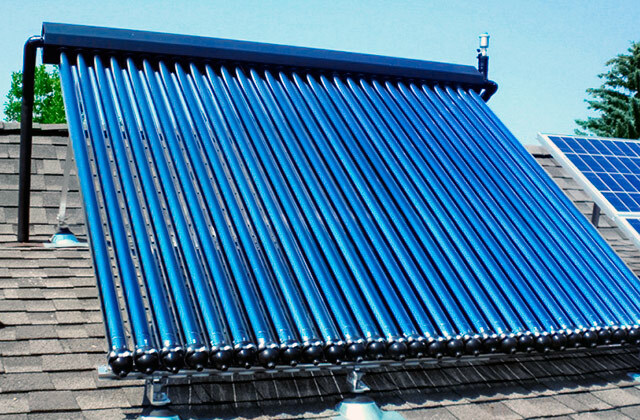 A heating element heats the air, which circulates in the room and warms it up. 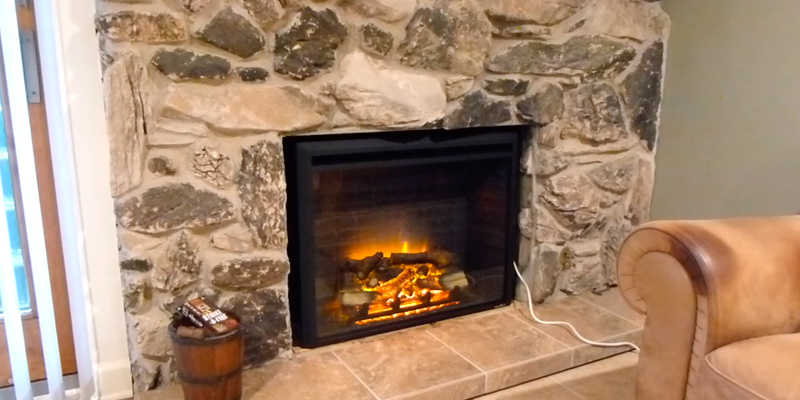 Most electric fireplaces are nearly noiseless. 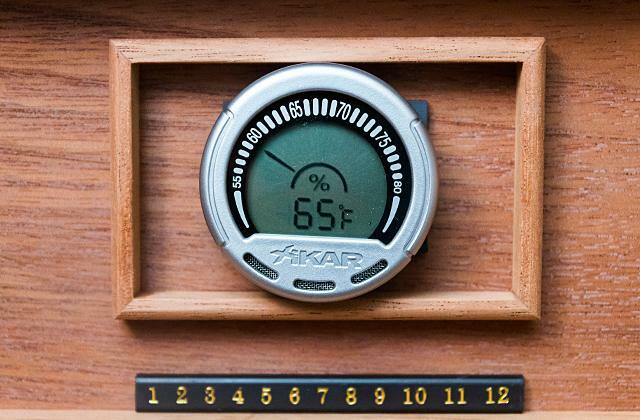 Also, you can usually select the temperature - most units have an adjustable thermostat. If you need a fireplace mainly for decor, you should choose a low-power model whereas if you need the unit for heating - pick a more powerful one. The final stage you shouldn't forget about is Usability and Safety. All electric fireplace heaters should be easy-to-use and maintain, so find out what type of animation every appliance has. It's usually an LCD display or an LED backlight. As a result, the fire looks real and if the animation is truly sophisticated, the wood logs will burn out. Moreover, the controls should be really simple - the best smokeless fireplaces come with a remote, so you can adjust all settings without leaving your sofa or chair. And it goes without saying, safety matters, so don't forget what safety precautions are included in every electric fireplace. Any decent unit must have overheating protection whereas portable models also must include tip-over protection.